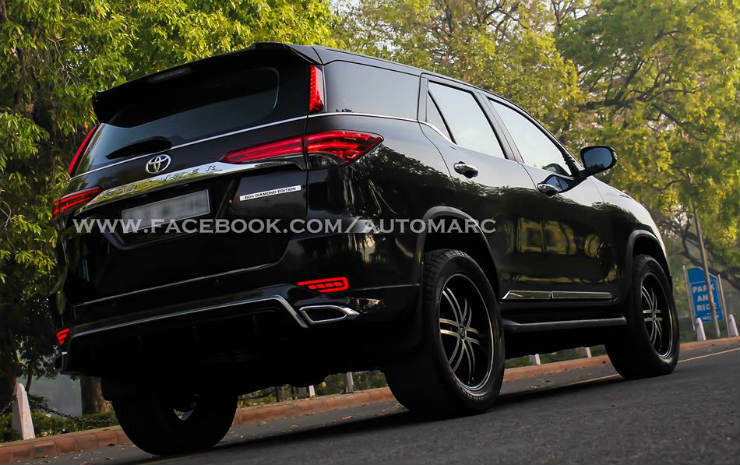 Modified 2016 Fortuners from India: Mean & menacing! The old Toyota Fortuner was among the commonly modded SUVs in the country. 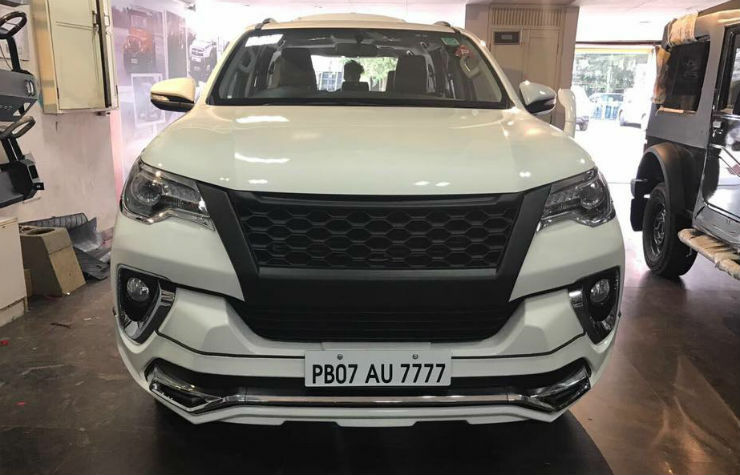 While the new one has just launched, there are a lot of examples of modified Fortuners already. 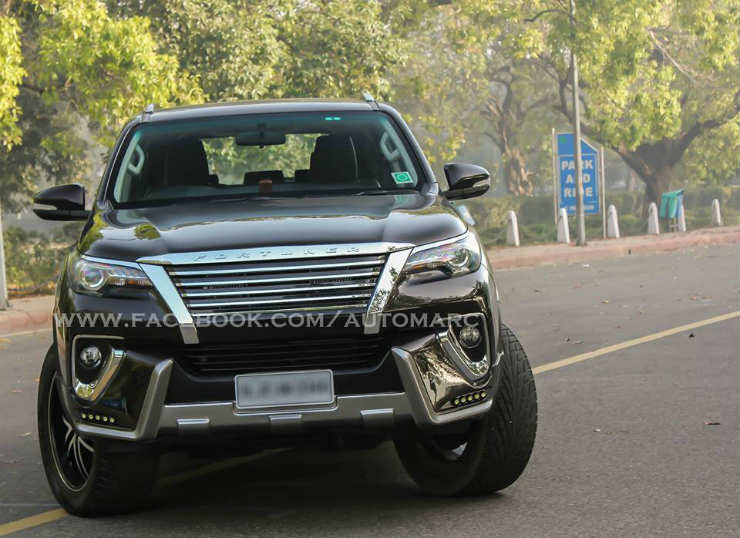 Here are 5 of the meanest, and most menacing modified new Fortuners from India. Here is the first example, done by Saak Auto Accessories in Chandigarh. This one looks very menacing. So what are the changes? The most noticable thing is the new honeycomb grille, which is something very unique. The best part though is the lack of chrome which gives the car a clean look. The bumper has been changed as well and now has a small chrome strip with the addition of new LED lights in the bumper. At the back is where this doesn’t look that good. While you have a new bumper which looks good, there is excessive use of chrome all over. The tail lamp surrounds, the boot and the bumper now get a chrome surround, which is something that is not to our taste. The reflectors in the bumper now house lights and there is a LED strip which has been added to the D-pillar of the SUV. This kit which you see here is also known as the Lexus style kit. That gives you a clear indication of where this is going. 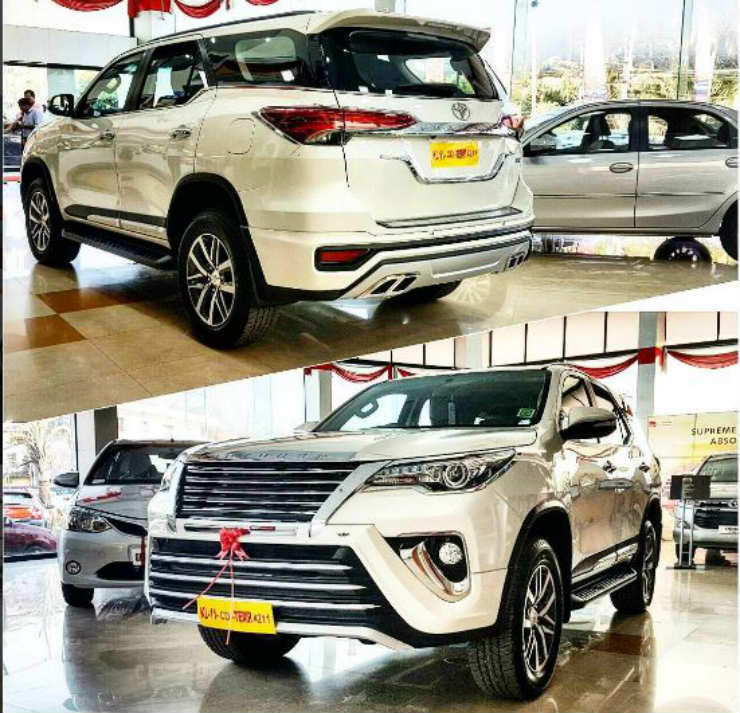 Well this kit makes the Fortuner look like a Lexus. The kit includes a new grille (Lexus style), a new front bumper lip with DRLs, side body moulding and a new rear bumper with a lip and functional lights. This one too has the LED lights on the D-pillar. In addition to this, this particular car has also gotten a bump in performance with the help of a Race Chip. This takes power upto 212 Bhp and 550 Nm, which is impressive given that the new Fortuner never felt slow. 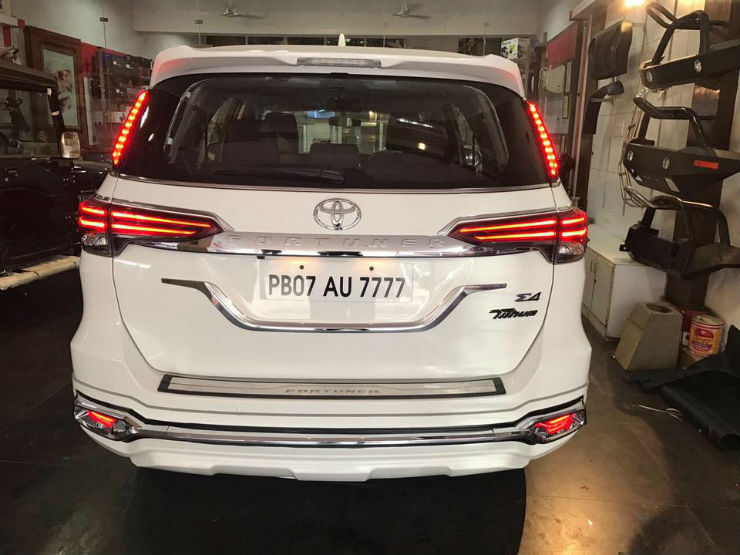 Nippon Toyota, a Toyota dealer from Kerala, has come up with their iteration of a modded Fortuner. 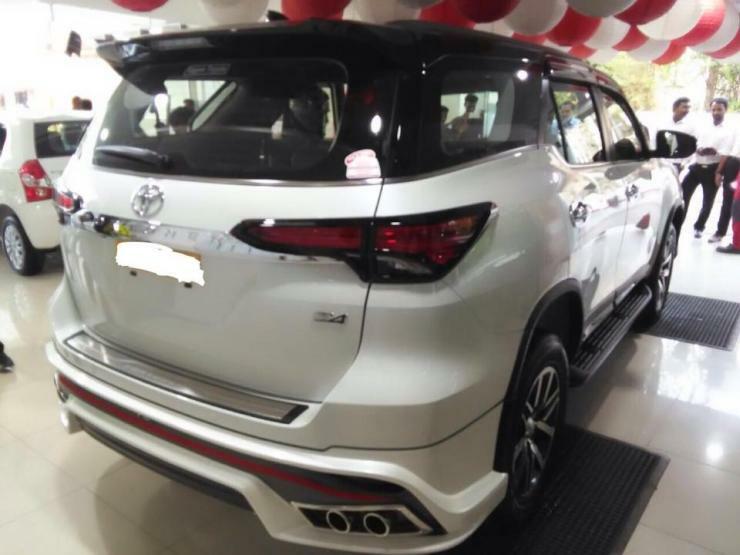 This one gets a new grille, Fortuner badging on the bonnet, new bumper up front with the TRD red stripe, a new rear bumper with diffuser and quad exhaust tips. The rear bumper has a red stripe as well. This very kit will set you back by Rs 2.0 lakhs, if you wish to get it done. 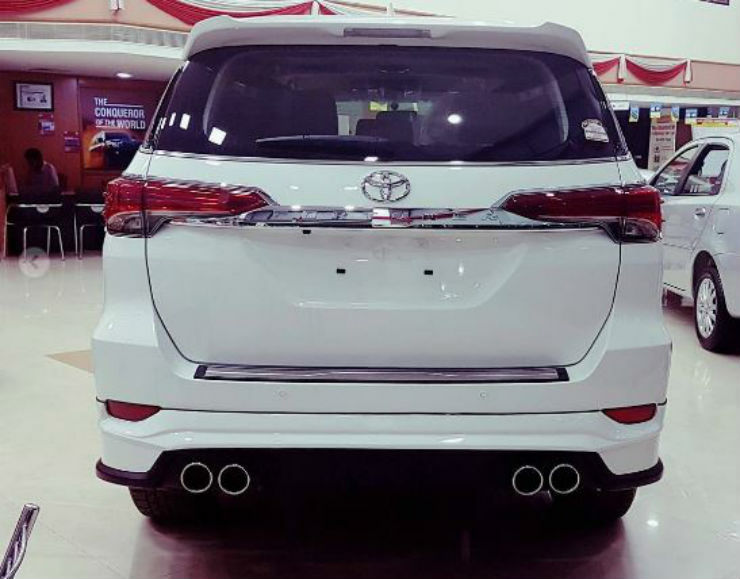 This and the next Fortuner have been done by the same dealer, Amana Toyota. This one has been given a mean make over. There is a new grille on offer, which is similar to the Lexus one, however the bumper is different. This is a more sporty bumper with the front lip and the provision for LEDs at the bottom. 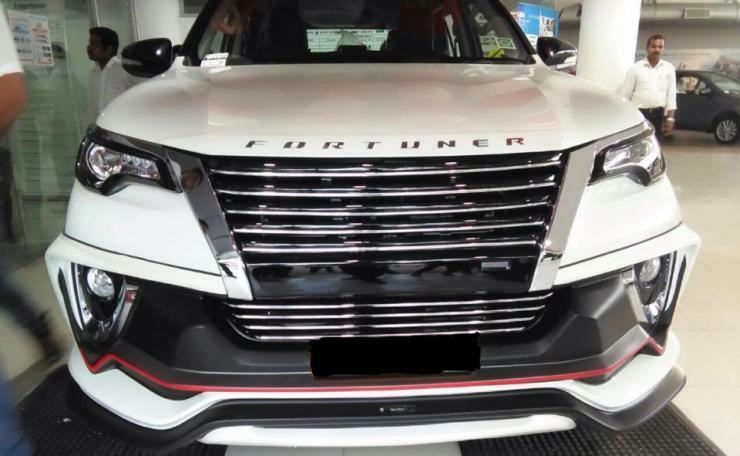 You also have the Fortuner badge on the bonnet, like you have on the Range Rover. At the back, there is a new bumper with quad exhaust tips and a diffuser. 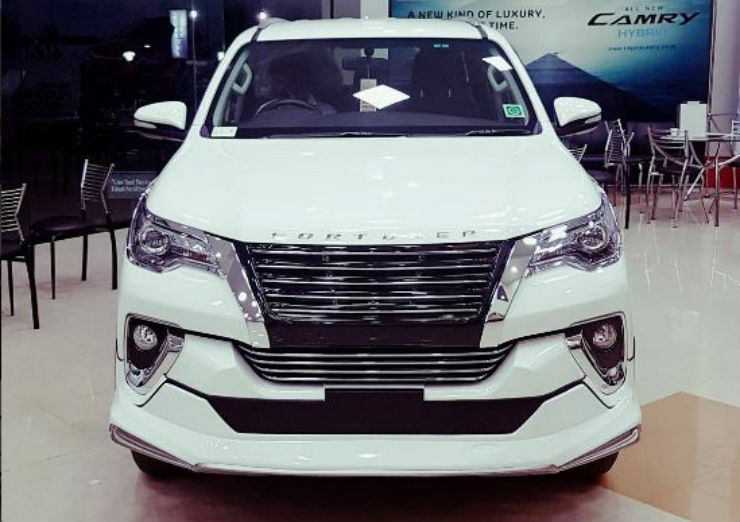 This Fortuner here has a completely different look to the other ones we have been seeing. So, you have a new grille, which is the Lexus styled one, however similarities end there. There is an all-new bumper with horizontal chrome slats that looks different. At the back, there is a new diffuser with quad exhaust, however this is the concealed one instead.